At its core, a life extension (LE) plan is a management system that provides assurance to the duty holder, regulators, investors, and other stake-holders that an aging asset can continue to safely operate beyond the original design limits. This may, or may not, include the necessity for repairs or upgrades to address fabric degradation and/or manage risks. The plan would, as a minimum, include a summary of present condition, a strategy to monitor pertinent aspects of the facility to continually verify fitness for service and compliance with regulations and, ideally, baseline contingency plans to mitigate credible risks. WHAT ARE THE BENEFITS OF A LIFE EXTENSION PLAN? There are many potential benefits to having a well-developed LE plan. Optimized LE plans span from the essential need to provide safety to personnel and the environment, through to addressing operational efficiencies that, in turn, increase investor confidence and increased return on investment. 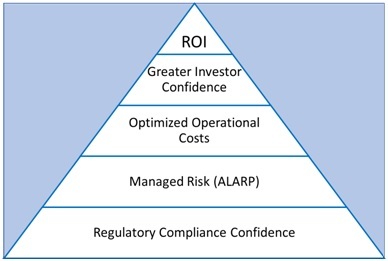 Although regulatory compliance may seem to be a prime driver, compliance simply creates a sound foundation on which to build a robust operational and business plan. Inevitably, the LE plan must contend with the assessment of an ageing asset that has seen years of services, experienced some uncertain extreme environmental loading, and was designed to a range of now superseded codes and regulations. The plan needs to address all these essential parameters. It must show that through a combination of analysis, risk-based assessments, and other effective mitigations the asset can continue to operate safety and effectively. Equally, the plan must assess the likely costs of achieving these goals as this is key to the business plan. 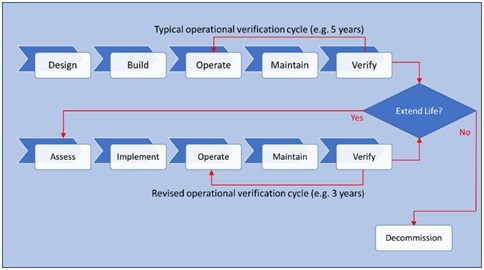 The typical life stages and cycle for an offshore asset, namely design> build> commission> maintain> verification, over the original design life, finally leading to decommission changes when the need for LE is identified. Assess: The stepwise process creates the technical justification for continuing operations, and the work needed to achieve this. Implement: There will be some form of work needed to kick off the LE process. This may range from structural upgrades to revising work-scopes and procedure for, say, enhanced periodic inspections. Operate: This is largely the same as the original operational activities but may be modified to maintain the condition of critical items. For example, more rigorous attention to detail to keep uncoated void tanks truly dry to minimize corrosion. Verify: This would be enhanced operational verification to ensure that critical items identified at the assessment stage are fully addressed. This systematic approach would allow the life of an asset to extended incrementally, say at 5-year to 10-year intervals. There would be periodic reassessment and “course corrections” to be made as the asset matures and additional performance data is gathered and assessed. These “course corrections” may be purely business or regulation driven, but can include aspects such as changes in operations. Being able to justify to all stake-holders that continuing operations of offshore assets beyond their original design limits presents many challenges. The drivers fall into four basic categories – safety, codes, technical, and business. Unless the needs of all four are addressed a feasible life-extension program will not exist. Safety is at the core of business culture and must be considered at the outset of a LE program. Changes in the risk profile of an asset will be occurring continuously as the asset ages. Ground rules need to be defined for periodic refinement of the risk assessments as the LE program progresses and then periodically throughout the extended operational life. The types, levels of detail and frequency of risk reassessment is beyond the scope of this paper. It is not expected that the asset will fully comply with codes and standards in place at the time of the LE review. The latest editions of codes and standards are intended to be applied to new designs and it would be extremely impractical and prohibitively expensive to apply to ageing assets. The expectation must be that the risks associated with not meeting the latest codes and standards are assessed and identified risks managed. Plan development: There will be desktop studies and, if necessary, site surveys to develop the documents that confirm that LE is achievable. Upgrades and repairs: Commonly, some form of work on the facility is required to sustain or support the LE. Examples of this are renewing corrosion protection systems, strengthening or replacing corroded steel or installing monitoring systems. Periodic Surveys: The extent and frequency of periodic surveys may be changed, as dictated by the regulatory bodies. Production interruptions: Items (2) and (3) above may require shutting in, or at least disrupting, production. The extent, timing, duration, and frequency of this needs to be estimated. All these considerations are useful lessons learned that should be applied to younger facilities that, almost inevitably, will be expected to continue to operate safely beyond their original design limits. The owners of these younger assets should be encouraged to invest in improved data management systems and, if necessary, additional or improved inspection and monitoring. Doing so in a smart way will have a positive impact on the LE assessment, when the time for that comes.